2 cups of all-purpose white flour. Preheat oven to 350 degrees Fahrenheit (175 degrees Celsius). Cream together sugar and butter until the sugar is dissolved and the mixture is nice and fluffy. Add the egg and mix until combined. Mix the flour in slowly until the dough just barely holds together. On a floured surface, knead the dough lightly and roll out into a flat disc. 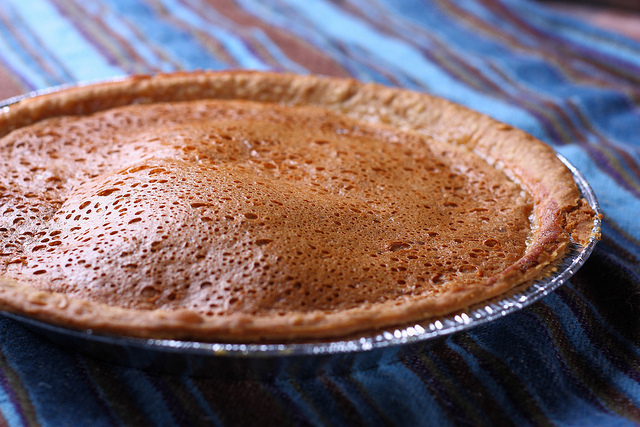 Place the dough into a 21cm (about 8 ½ inches) tart tin. Don’t worry, it’s supposed to be thick. Use baking beans over the pastry to prevent it from bubbling up in the oven. Put the tart tin into the oven for 15 minutes, then remove the baking beans and bake for five to ten more minutes, until pastry is a pale golden brown. If you don’t have baking beans press pastry down with a spatula every five minutes for the first 15. While the pastry is cooling, whisk the milk and sugar together until light and fluffy. Prepare yourself, though. It takes a good 15 minutes to do properly! When you’re done, the mixture will still look quite runny. Don’t worry. We’re not done yet. Pour the tart mixture over your pastry and throw it back in the oven for another five to ten minutes, or until the surface is tacky. Once you’re done cooking, let cool, and then chill in the fridge for two to three hours before serving. Tastes great with either warm or whipped cream, but be careful! The Gypsy Tart is crazy-sweet!